The Sculptor by Scott McCloud, First Second, an imprint of Roaring Brook Press, a division of Holtzbrinck Publishing Limited Partnership, 2015. Provenance: Saw it mentioned in passing on some web site, had to special order it from my Friendly Neighborhood Comic Shop (Fantasium, for all your comic needs). Also just it back from the third person I lent it to this year, since this was a book that I inflicted on friends and fellow creatives. So what caught my eye on the book in the first place was the author/artist. 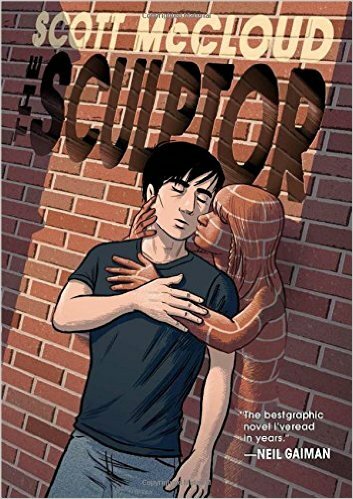 Scott McCloud some twenty years ago wrote a seminal work about sequential art - Understanding Comics, analyzing the component parts that make up a comic book story, the melding of art and words, the purposes of the gutters, the engagement required by the reader, all that. Seriously, if you're interested in comics as a medium, you should have engaged with this book. But that's not the one I want to talk about (nor is Zot!, which was a monthly book he was writing/drawing). The Sculptor is the story of David Smith, the sculptor of the title. He's struggling in New York, trying to overcome both the limits of his ability to manifest his thoughts in his work and his own self-destructive behavior (he doubts himself, and wants everyone else to doubt him as well). So he meets god. Or death. Or the devil. Or destiny. Let's go with death, presented in the form of David's late Granduncle Harry. Granduncle Harry has a deal - David gets to power to work stone and other solid materials with his hands directly, to fully express his art. But it will only last 200 days. And at the end, David will die. That's the story - the next 200 days. It does not go smoothly. Smith sabotages himself more than a few times. He meets Meg, a young performance artist who takes him in, pulls him back from the edge a few times, and reveals to have edges of her own. Finally we come to the end of the 200 days in a larger than life resolution. McCloud is deeply involved with how comics are presented, and verges on being a prophet for the media. So his work bears the scrutiny on that level. And McCloud soars in his page design and how he moves the characters effortlessly from frame to frame, capturing emotion and action (and inaction) within each panel. McCloud's artistic style is straightforward, almost simplistic in places, but his character designs are distinct and his backgrounds capture a flavor of artistic NYC that is currently relocating to cheaper digs. McCloud also deals deeply with his characters, in particular with depression. And succeeds in presenting characters that are easily presented at first, yet deep and engaging. You get the postcard version of most of his supporting cast within two panels, and only as time goes by do you see their larger and deeper lives. Neither David nor Meg are perfect, and there a moments that you want to thwack them both across the back of the head and send them off in happier direction. But the narrative is so good that you pull through with them, and want their succeed regardless of the fact that you know it will have to end all too soon. That takes great ability. The Hugos have a category for Graphic Story, and this should be there, hands down. This is not only fantasy but noteworthy fantasy. The thing that works against such recognition, though, is the nature of selling graphic stories, not in telling graphic stories. Published by a teeny tiny branch of a small press belonging to a large publishing house, which itself is grouped with other publishers under a behemoth corporation, it has a mayfly life in the public eye. I had to order it from my comic book dealer, so it may have been a blip in the Diamond catalog if at all. So the only thing going for it is the memory of those who have read it and passed it along. Like every other piece of art. There is a lot of sensitive stuff in here, and lot of material that engaged me both as a creative and as a reader. Of everything I've been writing about this year, this would be the book I would press in to the hands of others, to get them to read. Now you have been warned.